The Redondo Beach Harbor Commission was a jam packed meeting as the commission deliberated the controversial waterfront redevelopment project. REDONDO BEACH — The clock almost struck 2 a.m. on Aug. 9 when the Redondo Beach Harbor Commission adjourned its Aug. 8 meeting. A moment earlier commissioners narrowly approved the Final Environmental Impact Report (EIR) for the ambitious waterfront revitalization project spearheaded by CenterCal Properties after more than seven hours of deliberation, public comment and review. Four of the six commissioners present voted to approve the Final EIR. 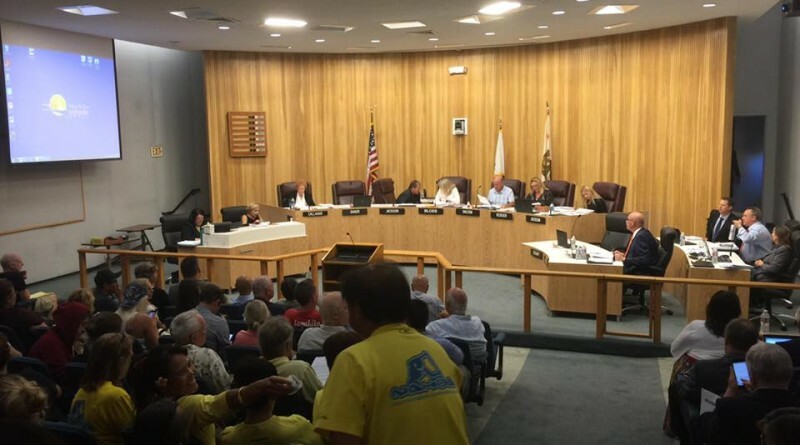 Harbor commissioners were ultimately caught between a rock and a hard place since whatever they decided would have been appealed to the Redondo Beach City Council. Accordingly the Aug. 9 vote is not final. The commission appeared to have mixed feeling about the project. Some design elements were questioned and a few commissioners wondered why CenterCal took so long to build a three-dimensional scale model of the revitalization project. (The developer introduced a scale model of the Waterfront project at its El Segundo headquarters in July). “With this project I have found as many pros as I have cons,” said Commissioner Vicki Callahan, who was one of the two votes against the Final EIR. A majority of the commission also favored Mole B as the home of a new boat launch ramp despite an expressed concern of safety there by boaters and a retired harbormaster. Commissioner Bryan Dalton said the city has more control over Mole B and a boat launch ramp could be built pretty quickly. Meanwhile Commissioner Kari Keidser said the commission and city are prioritizing commercial interests over boating and safety, adding the Final EIR is inadequate. Keidser, the other commissioner who voted against approving the Final EIR, said Mole B was far from an ideal location for a boat launch ramp. She continued placing a boat launch ramp at Mole B could force boaters to make turns directly into the main channel, which could be filled with boats and other crafts during busy summer weekends. A debate has raged for years of where to place a boat launch ramp. Mole D at the northernmost end of the harbor considered an ideal location for the boat launch ramp prior to CenterCal’s selection as the city’s vendor for the revitalization project. Building a boat launch ramp at Mole D became a sticking point to CenterCal’s plans and the city began looking at Mole C as a compromise location. City staff then recommended the boat launch ramp be built at Mole B. The recommendation was made after the Draft EIR was released. Building a boat launch ramp at Mole B, according to the commissioners in favor of the location, could be built quickly and more economically. However, in addition to concerns of whether the location would be safe for boaters, a boat launch ramp at Mole B also puts an outrigger club in an awkward situation. The mole has been home to outrigger operations since 1990. Lanakila Outrigger Canoe Club has grown large enough to occupy a large chunk of land at Mole B. Adding a boat launch ramp there could create a crowded space, forcing the outrigger club to downsize its operations. Whether boaters and the outrigger club must find a way to co-exist at Mole B still remains to be seen. The City Council could trump the Harbor Commission’s preferences and direct a boat launch ramp to be built at Mole C.
At least one concern of a launch ramp being built at Mole C is its proximity to Seaside Lagoon. If CenterCal’s plans are realized the redesigned Seaside Lagoon would open up to the harbor, allowing standup paddleboard users almost direct access to the ocean. Some commissioners opted for Mole B because, in addition to its lower cost and fewer time constraints, they believed boats launching from Mole C would be a danger to standup paddleboard users navigating from Seaside Lagoon to the ocean. CenterCal’s Waterfront project overall was met with mixed reviews. An overflow crowd of about 300 people packed Redondo Beach City Hall the afternoon of Aug. 8 in hopes of chiming in on plans and sticking around long enough for a vote. Only a few dozen people were inside Council Chambers when the Final EIR vote was lodged just before 2 a.m. on Aug. 9. Supporters of the project mostly said the city had a great opportunity to revitalize a dilapidated area of town. No plan is perfect, some supporters stated, but the city must move forward with CenterCal’s proposal. Otherwise it could be another decade or longer before the city had another opportunity (and developer) to revitalize the harbor area. Opponents worried the revitalization plans were too big and should be scaled down before moving forward. Others complained the project did not provide enough view corridors and some believed CenterCal’s proposal, if realized, would restrict beach access. A long path still remains ahead for the CenterCal revitalization project. An appeal of the Harbor Commission’s decision is all but certain. If CenterCal still has a project in place after the City Council deliberates the appeal then plans would have to be vetted out by the California Coastal Commission. Fred Bruning, CEO of CenterCal, hopes construction on the revitalization project will begin at some point in 2017.